A £2m project to transform a park in Dorset has begun. The work at Poole Park, which is due to be finished by next spring, involves building a new restaurant and creating an indoor ice rink for children. In addition, part of the main lake will be dredged in order to reintroduce sailing at the park. A Poole Borough Council spokesman said there would be a period of disruption over the next few months, but it would try to keep it to a minimum. 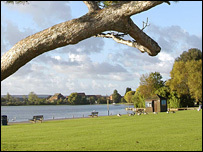 The £2m project is being funded by the current owners of the cafe in Poole Park, which is being refurbished. Developers have contributed to the £200,000 needed to dredge the lake. The dredged sand will be used to create a number of small islands, which will be illuminated in the evenings.